Yeah, it’s me making a release post. sm2345 is too busy, so I had to make this post. 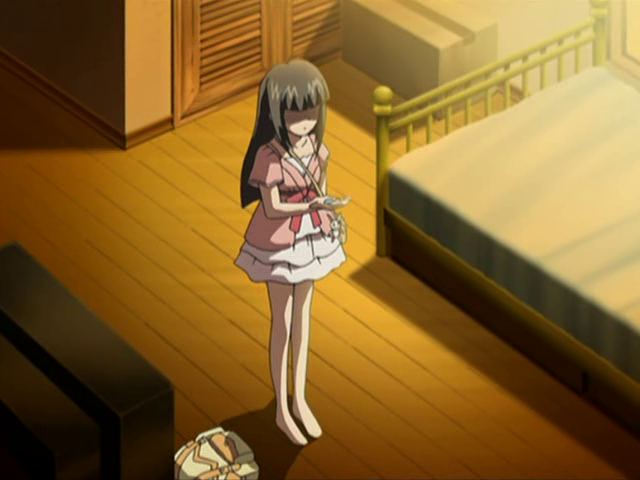 In this episode, Momoko decides to accept things as it is and continue to put on her trademark laugh. She does so by putting on a cheerful facade while in actual fact hiding the sorrows of the sudden heartbreak in the previous episode. I guess we all put on facades in real life too. That is part and parcel of life and at times, you just get very tired of this endless process of hiding your true self. I am sure Momoko is hanging in there. Credits to Yours Truly, for the translation. The rest of the stuff are done by sm2345 while distro is done by MarukoM. I shall end off the post with a random trivial. The ED of Love GetCHU (Cry a Little) is performed by May Nakabayashi, now popularly known as May’n (Pronounced as “Main”). Prior to her success in 2008 for the singing voice of Sheryl Nome in Macross Frontier (25th anniversary of Macross franchise), she was a relatively unknown singer. I’m sure in 2006, no one could have known she would become such a huge singing sensation 2 years later. Holy crap, that’s May’n??? I hate the LGC ED so much! This doesn’t change that. Thanks again for keeping up with this series. You’re the best!